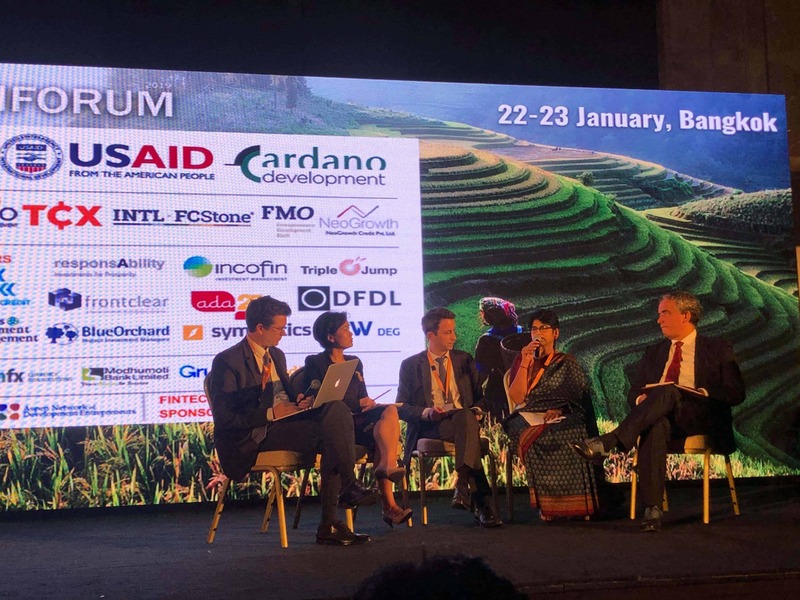 BANGKOK, January 25, 2019 – USAID Green Invest Asia co-organized the inaugural Asia Financial Institutions Forum held from January 22 to 23 in Bangkok. The forum focused on development finance in Asia and drew more than 500 participants representing almost 40 nationalities, of which 40 percent were investors. The forum addressed challenges at the intersection of finance and development, including: Who pays for technical assistance? How to de-risk investments? How to improve product traceability with complicated, long supply chains? And the million-dollar question for sustainable businesses and investors alike: How to balance revenue and responsibility? Globally, only one quarter of financial assets under management come with a mandate to incorporate environmental, social and governance (ESG) factors, driven predominantly by European investors, companies and regulators. Asian signatories to the UN Principles for Responsible Investment total 153 – out of a global total of 2,183, according to Refinitiv, a global provider of financial market data. But, conference participants say change is underway. Last year, the market for “green” bonds earmarked for environmental and climate projects grew globally by $167 billion, according to Climate Bonds Initiative. Asian markets accounted for the greatest rise, jumping from zero in 2013 to more than $36 billion five years later. “Asian capitals are buzzing,” said John McGinley, co-founder of Mekong Strategic Partners, as he moderated a session on where the financial industry would be in 2020. McGinley is a strategic advisor with USAID Green Invest Asia, a flagship climate finance hub funded by the U.S. Government that provides technical assistance to unlock investments into sustainable agriculture and forestry in Southeast Asia. The demand for additional green investments in Asia and Southeast Association of Southeast Asian Nations (ASEAN) from 2016 to 2030 is an estimated $3 trillion, according to a 2017 report by UN Environmental Programme and DBS Financial Services; $400 billion of the needed funds are for food, agriculture and land use. “We have a huge opportunity to push the envelope on structuring transactions,” said CEO of the Hong Kong-headquartered ADM Capital Foundation, Lisa Genasci. Agriculture and forestry are still widely considered difficult, risky investments, according to Genasci and other panelists in a session on agribusiness and forestry. Challenges include traceability – the ability to trace a product’s supply chain to identify social and environmental hazards; challenge of de-risking investment products; lack of reliable land tenure in many parts of Asia, and; the need to work through multiple middlemen, a “hugely important intermediary” in Asian agriculture, said Anil SG, CEO of Samunnati, a financial services company focused on smallholder agriculture in India. Despite current challenges, he predicted “all of us [investors] will be focused on [climate-smart agriculture]” in the coming years. And who pays for this technical assistance? For the German finance institution DEG, costs to develop sustainable businesses are integrated into its operating costs. “The real cost is inaction,” said Petra Kotte, DEG’s senior director. USAID Green Invest Asia is developing two tools aimed at financial institutions in Southeast Asia, which will be finalized in the coming months: guideline to conduct environmental and social assessments of land-use focused businesses that evaluates the risks and opportunities of sustainable versus non-sustainable land use, and; a methodology to extend ESG or sustainability-linked loans to small and medium enterprises.